Studying colonialism and indigeneity in North America and elsewhere requires confronting several important questions. How do archaeologists and other anthropologists measure culture change and continuity and at what scale, and is this even the right question? How do people engage their pasts to live through their present and anticipate their future, and how do we recognize these experiences of time? What terms best capture these cultural process? 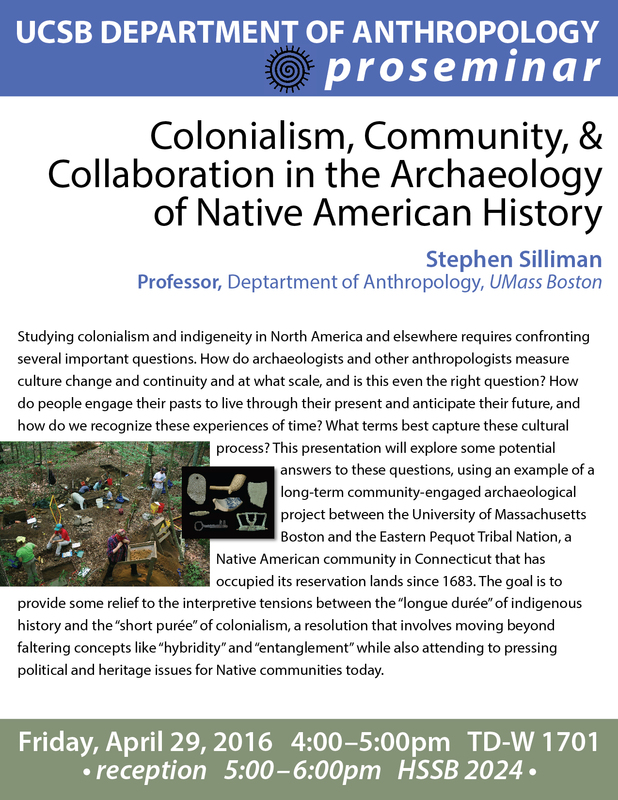 This presentation will explore some potential answers to these questions, using an example of a long-term community-engaged archaeological project between the University of Massachusetts Boston and the Eastern Pequot Tribal Nation, a Native American community in Connecticut that has occupied its reservation lands since 1683. The goal is to provide some relief to the interpretive tensions between the “longue durée” of indigenous history and the “short purée” of colonialism, a resolution that involves moving beyond faltering concepts like “hybridity” and “entanglement” while also attending to pressing political and heritage issues for Native communities today.